I recently ordered a pair of Campag Shamal Ultra wheels for my Colnago. When I got home from work last Tuesday they had arrived. I rushed to fit tubes, tyres and cassette to them to go out for a quick test ride before it got dark. According to the advert, the rear was fitted with a Shimano 9/10-speed compatible hub; that meant that I needed to fit a 1 mm spacer behind the cassette. So that’s what I did, but the cassette felt slightly loose. When I went out for my test ride I had to cut it short after just a mile or so because there was a terrible (yet familiar) rattling coming from the cassette every time I rode over a bump in the road. It even slipped a gear as I was returning up Barn Hill. I didn’t have time to investigate it fully for a couple of days, but I did quite a bit of research on the web to no avail; it all confirmed what I already knew – i.e. a 1 mm spacer was all that was required. When the weekend arrived I decided that I would take the cassette off and measure the length of the hub and compare it to the length of the hub that the cassette originally came from (supposedly the same Shimano 9/10-speed). 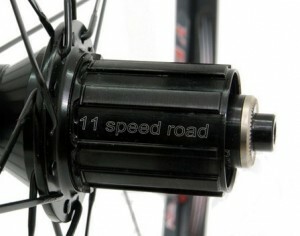 I took the cassette off and while I was measuring it I noticed the words “11-SPEED” printed on the hub. Aha! So it wasn’t a 9/10-speed hub – it was 11-speed. I immediately consulted this goldmine of information and saw that I needed a 1.85 mm spacer in addition to the 1 mm I already had. Further research revealed that this spacer should have been supplied with the wheels, so I was a bit peeved that it hadn’t been. Even worse: they didn’t seem that easy to get hold of either; someone on eBay was selling them for £6 each! I wasn’t going to pay that much, so I called a couple of local bike shops to see if they had any. The first one said no. 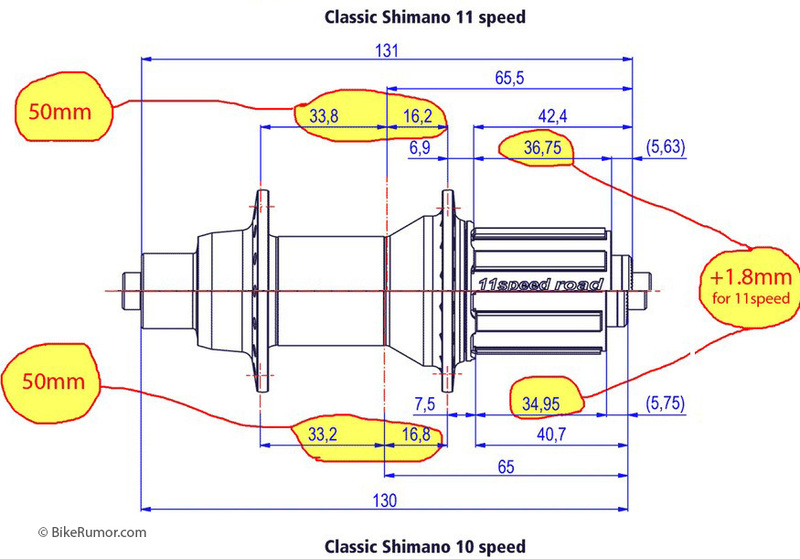 The second one, after a lengthy discussion, during which I convinced the so-called ‘expert’ that 11-speed hubs were longer than 9/10-speed hubs, said no, but they did have plenty of 1 mm spacers in stock; maybe I could use two of those? So I decided to ride to the said LBS to get a couple of 1 mm spacers (£1 each). However, I still really wanted to try out my new wheels. But I didn’t have the required 1.85 mm spacer – but I remembered that there was a 1.75 mm spacer on my Mavic wheels; surely that would be close enough! So I proceeded to take the cassette off the Mavics to borrow the 1.75 mm spacer from there. By this time the kitchen table had 3 rear wheels and various cassettes and bike tools all over the place – it looked like a bike workshop! I next refitted the cassette to my new wheels using the borrowed Mavic spacer and the 1 mm spacer. It was fine – totally secure, with no wobble. I rode to the bike shop (the new wheels felt great) and asked about the spacers. A mechanic emerged from the workshop with 2 spacers in hand and said “there you go”. I said “so they should be the same as this one”, as I pulled from my back pocket a 1 mm spacer that I had taken along for comparison. He took it from me and lined it up next to one of his and said “these are slightly thicker than your one”. “Aha, that could be even more useful”, I said, knowing that I was actually after 1.85 mm, and at the same time thinking “I won’t be bringing my bike here for any work; they don’t even know that a 1 mm spacer should actually measure 1mm!” I bought the spacers and was on my way. As soon as I got home I measured the new spacers using a micrometer. They were 1.6 mm! After further experimentation, the details of which I won’t go into here, I decided that the 1.6 mm spacer seemed to work fine, as a substitute for the more correct 1.85 mm one. seriously in need of ‘getting a life’! I now know much more than I ever wanted to about cassette/hub/spacer compatibility! I am also an expert in changing cassettes, having done it about 20 times during the course of this exercise. This entry was posted in Maintenance by Vince. Bookmark the permalink.